Undefeated Ghanaian boxer, Isaac “Royal Storm” Dogboe, put himself in readiness for a world title shot in Las Vegas after beating Javier Chacon to defend his WBO International Junior Featherweight belt last Saturday night at the Bukom Boxing Arena in Accra. Dogboe proved too strong for the former world title contender after stopping the Argentine in the sixth round via a Technical Knockout in front of a packed crowd, including former President Jerry John Rawlings and boxing legend Azumah Nelson. 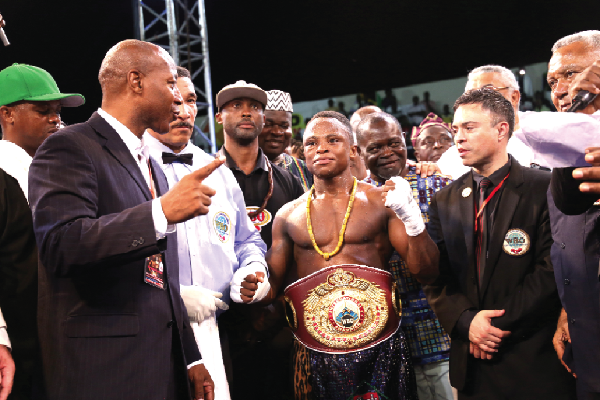 With the victory well cemented, World Boxing Organization (WBO) representative in Ghana and a former Ghana Boxing Authority (GBA) chief, Samir Captan, says he expects Dogboe to mount the ring to challenge for a world title fight by the end of this year or early next year. He told the Graphic Sports in a post-fight interview that the time was ripe for Dogboe to storm Las Vegas to prove his talent to the world by ending the country’s search for another world title glory. “With this performance, Dogboe will now have the opportunity to challenge for a world title later this year or early next year. “This is the time for him to go to Las Vegas to prove his talent at the world stage and to the entire nation by ending the country’s drought,” Mr Captan said. Argentine Chacon retired on the stool at the start of round seven having complained to his corner about an injury to his left hand after being subjected to a lot of punishment by the Ghanaian. Dogboe attacked his opponent right from the first round as he went straight at the South American with ferocious punches with the Argentine forced to defend deep by the Ghanaian. The 22-year-old title holder continued his swift display in round two and three after connecting several punches and leaving Chacon with no antidote but to endure the punishment. In round four, both boxers went at each other but it was Chacon who mastered a left hook that caught Dogboe on the jaw but managed to revive himself. A resilient Dogboe continued his dominance in the fifth and sixth rounds after pounding on Chacon by landing both left and right hooks that nearly sent Chacon to the canvas but the strong Argentine stood firm to continue. The victory improved Dogboe’s record to an impressive (17-0, 11 KO’s), with Chacon is now at (25-4-1, 7 KO’s) after the bout. Speaking after his impressive win on the night, Dogboe said he was ready to go to Las Vegas and follow in the footsteps of legendary Azumah Nelson by delivering a world title for the nation since that had been his focus throughout his career. “I won but had to keep my composure to do so because Chacon is a tough and tricky boxer who can cause any upset at any given time. “The nation wants me to walk in the shoes of legendary boxer Azumah Nelson and I am ready to challenge for a world title since that had been my focus throughout my career,” Dogboe said.